Game-changing apps and mind-blowing AI technology at this year's Adobe Meetup London. This content is sponsored by Adobe. Last week, we attended Adobe Creative Meetup London: Best from MAX 2018 to learn more about innovations to the latest Creative Cloud apps. And we – and the thousands of artists, designers and content creators who watched the live stream around the world – weren’t disappointed. Principal Manager of Creative Cloud Evangelism at Adobe, Rufus Deuchler, kicked off the evening with some of the most exciting news from Adobe MAX, Adobe's annual creativity conference. He was swiftly followed by three stellar speakers, who took to the stage to share their experiences and advice for making it in the creative industry. First up was graphic design duo, Miraphora Mina and Eduardo Lima, aka MinaLima, who wowed the crowd with their awe-inspiring work on the Harry Potter™ film series. Next, Patricia Bright, one of the fastest-growing lifestyle content creators in the UK, with a following of 2.6 million people on YouTube, shared some insight into the life of a successful videographer. If you couldn't make it, fear not. You can watch what happened at the Meetup right here. So what did we learn during this epic evening of creative inspiration, we hear you ask? A lot. 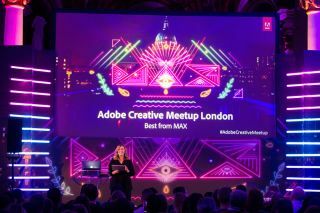 Here are our top insights from Adobe Creative Meetup London: Best from MAX 2018. Adobe Sensei has well and truly arrived. Adobe’s mind-blowing artificial intelligence and machine learning platform has now transformed almost all of Adobe's apps, making the creative process faster, smarter and more intuitive. Take the all-new selection tool in Photoshop, for instance, or the way that Sensei understands the best way to light a scene in augmented reality app Project Aero, enabling it to blend seamlessly in the real world and add realism to AR objects. Don't believe us? Watch this video and, trust us, within a few minutes you'll have changed your mind. Helping creatives go from concept to completion much faster, to succeed much faster, this advanced technology is already revolutionising the creative process. ...at least, in terms of creative workflow. As well as Sensei accelerating the creative process, 2019 will see the arrival of three brand new Adobe applications: drawing and painting tool Project Gemini (see above), Adobe's augmented reality app, Project Aero and Photoshop for iPad. If the jaw-dropping demonstrations shown at Adobe MAX are anything to go by – like when Kyle T Webster, above, revealed the new ultra-realistic watercolour and oil painting brushes in Gemini – we're not surprised artists and designers feel hugely excited by the opportunities and creative freedom these new apps look set to offer next year. After almost two decades working in the film industry, graphic design duo Miraphora Mina and Eduardo Lima, aka MinaLima, were keen to share not only their passion for film, but the opportunities the field offers too. "I don't think many people realise that graphic design in film is a career option," Miraphora Mina said. "It's true that the film industry can be impenetrable, but there is still a lot of opportunity for doing graphic design in film." "Don't be frightened. Find what you want to do, even if it's a bit weird, like creating worlds that don't exist, and go for it." UK Content Creator Patricia Bright took part in a insightful interview, hosted by Adobe Senior Director of Campaign Marketing Simon Morris, in which she shared the story of how she made it to the top. "I had no idea what I was doing when I was making videos in the beginning," she said. "I had a camera propped up on shoe boxes at the start!" Bright's success came after years of self-teaching and a whole lot of hard work. "I learnt via social media platforms, I didn’t go to classes or school," Bright said. "Friends and other creatives reached out to help edit my videos. But nowadays there's so much information out there to help you learn, and it's affordable." One of the biggest things to come from MAX was Adobe's all-new video editing app Premiere Rush CC. Available now as a standalone app, Rush promises an intuitive, all-in-one experience that will make it easier than ever to create professional-looking video content (even if you're not a video expert yourself). Creative Cloud now includes Adobe Fonts (formerly Typekit). That means CC subscribers now have access to a huge selection of typefaces, with no more sync limits, no more web font pageview and domain limits, and no more 'web-only' fonts. Unsurprisingly, this was quite a crowd-pleaser on the night. The next generation of Adobe XD comes complete with all-new voice prototyping features – and Adobe says it's the only UX/UI platform to enable designers to create prototypes for voice-activated devices. Using Adobe XD's voice trigger and speech playback capabilities, designers can move seamlessly between voice and screen prototyping. As voice starts to play an increasingly important role in our digital experiences, XD now offers a way for users to design and share prototypes that extend beyond the screen. Exciting stuff. Among Deuchler's Creative Cloud announcements came the news that Adobe has invested in Adobe Bridge for 2019. "Adobe Bridge is rising from the ashes!" Deuchler said. "That's something I never thought I'd say in 2018." He went on to explain how the new Bridge can work as the perfect hub for all creative work, sporting a modern new UI and the ability to support bulk uploads of CC libraries. Adobe's vision is to enable creativity for all, and the innovations announced for Creative Cloud 2019 look set to facilitate exactly that. Whether you're a seasoned pro, or just starting out in your chosen creative field, Creative Cloud is your one-stop-shop for every creative tool you could ever want, wherever you want. And the apps are more intuitive and faster than ever before.